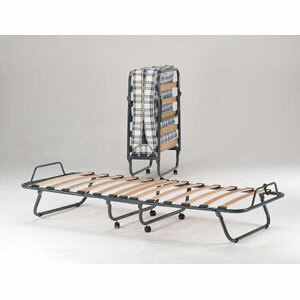 Complete Folding Bed with Metal Frame and 4 In. Inner Spring Mattress. Features 12 Wooden Slats for quite sleep and support. Four Wheels for easy mobility. The Metal Frame is in black finish. Mattress Color will not be as shown. In Stock. This item usually leave our warehouse in 1 to 2 business days.